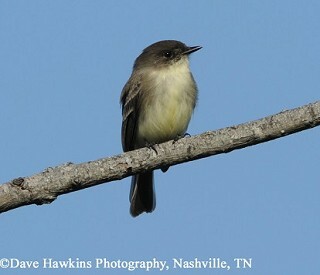 This is likely the most familiar flycatcher in Tennessee due to its habit of nesting on buildings and bridges. The Eastern Phoebe characteristically pumps its tail up and down and the fee-bee call will remind you of its name. It breeds from western Canada eastward to the Atlantic Coast, and southward to central Texas and central Georgia. The winter range extends from Maryland to eastern Mexico, and along the Gulf Coast to Florida. The Eastern Phoebe is present in Tennessee year round but is less numerous in the winter as some individuals migrate further south. Description: This small songbird sits upright and often pumps its tail, especially after landing. It is dark grayish brown above, and has whitish underparts that may be washed with yellow. The Eastern Phoebe has no eyering or conspicuous wingbars. males and females look alike. Voice: The song is a slightly burry two-noted fee-bee. The call note is a flat toneless chip. Eastern Wood-Pewees don't wag their tails, and they have distinct wingbars. Empidonax flycatchers have distinct wingbars, usually have a distinct eyering, and also don't wag their tails. Habitat: Found in woodlands and along forest edges with rock cliffs. Also rural and agricultural areas where it nests on houses, barns and under bridges. Diet: Flying insects, occasional small fruits. Nesting and reproduction: Eastern Phoebes are typically double brooded, keeping the same mate for both broods. Egg laying typically extends from late March to late June. Clutch Size: 5 eggs, with a range of 2 to 6. Incubation: Females incubate the eggs for 16 days. Fledging: Both adults feed the young, which leave the nest in 16 to 18 days. Nest: The female builds a mud and moss nest either on a horizontal surface or attached to a vertical surface of natural or human-made structures. Natural nest sites include under overhanging rock ledges or inside the mouth of caves. Status in Tennessee: Common breeder across the state generally increasing from west to east. They are present throughout the year, though many migrate further south in winter. Their numbers are stable or possibly increasing in the state. In 1804 the Eastern Phoebe became the first banded bird in North America. John James Audubon attached a silvered thread to an Eastern Phoebe's leg to track its return in successive years. The use of buildings and bridges for nest sites has allowed the Eastern Phoebe to expand its range. However, it still uses natural nest sites when they are available. The oldest known Eastern Phoebe in the wild was 10 years, 11 months old. Best places to see in Tennessee: They are found year round near suitable nesting sites in every county in the state.